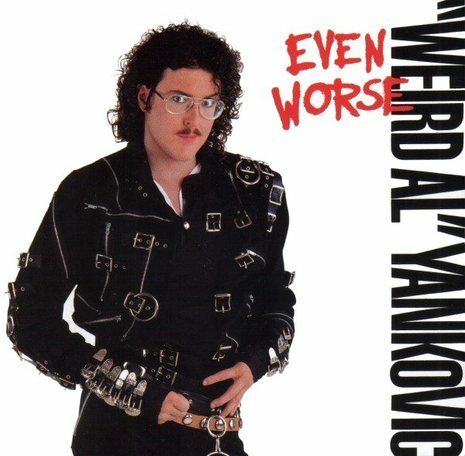 Even Worse is the fifth studio album by "Weird Al" Yankovic, released in 1988. The album was the fifth produced by former The McCoys guitarist Rick Derringer. This album, like Polka Party! before it, themed all but one of its parodies. In addition, Even Worse has the distinction of being one of two albums by "Weird Al" Yankovic not to have any polka renditions of pop songs or medleys, the other being his debut album "Weird Al" Yankovic, released five years earlier. Peaking at number twenty-seven on the Billboard 200, the album produced one Yankovic's more famous singles, "Fat," a parody of Michael Jackson's "Bad", which peaked at number ninety-nine on the Billboard Hot 100 and was a smash success on MTV. The album helped revive Yankovic's career after the commercial and critical disappointment with Polka Party! in 1987. The album was quickly certified Gold and later Platinum for sales of over one million copies in the US, which, at the time, was Yankovic's first Platinum record. In addition, "Fat" was nominated and won a Grammy Award for Best Comedy Recording in 1989.